High Performance Intelligent USB to 1-port CAN Converter. Supports operating temperatures between -25 to 75°C. I-7565-H1 and I-7565-H2 are the high performance intelligent USB to CAN converters with one and two CAN channels separately. They provide faster CAN bus communication performance than I-7565. Both I-7565-H1 and I-7565-H2 support CAN2.0A/2.0B protocol and different baud rates from 5 Kbps to 1 Mbps. The important feature of I-7565-H1/H2 is to support the user-defined baud rate function no matter what the baud rate is. When connecting I-7565-H1/H2 to PC, PC will load the relevant device driver automatically (hot plug & play). Therefore, users can make data collection and processing of CAN bus network easier and quicker by applying I-7565-H1/H2. The application fields can be CAN bus monitoring, building automation, remote data acquisition, environment control and monitoring, laboratory equipment & research, factory automation, etc. The following is the application structure for these two USB/CAN modules. The PC can be the CAN host, monitor or HMI to access/control the CAN device through the CAN network by the I-7565-H1/H2 Converter. These modules let users to communicate with CAN devices easily from PC with USB interface. (1) I-7565-H1: High Performance intelligent USB to 1- port CAN bus Converter. (2) I-7565-H2: High Performance intelligent USB to 2- port CAN bus Converter. The CAN port of I-7565-H1/H2 is isolated with 2500Vrms. This isolation can protect the local devices from the damage signal coming from CAN network. 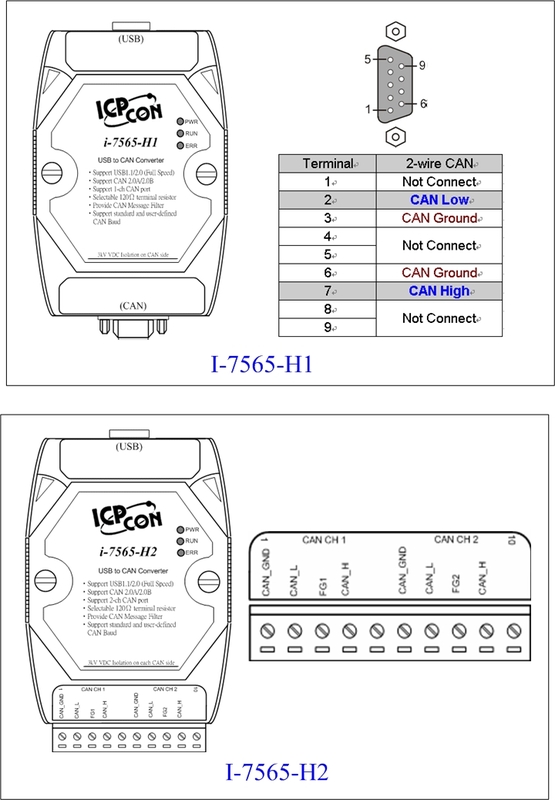 The I-7565-H1/H2 Watchdog is a hardware reset circuit to monitor the operation status of I-7565-H1/H2. When working in a harsh or noisy environment, the I-7565-H1/H2 may be down by the external signal. The circuit may let the I-7565-H1/H2 work continuously and never halt. There are three indicators on the I-7565-H1/H2.The power indicator can help user to check whether the I-7565-H1/H2 is standby. The communication indicator is used to show whether the I-7565-H1/H2 is transmitting/receiving messages. The Error indicator will be turned on when some errors occur on the I-7565-H1/H2. 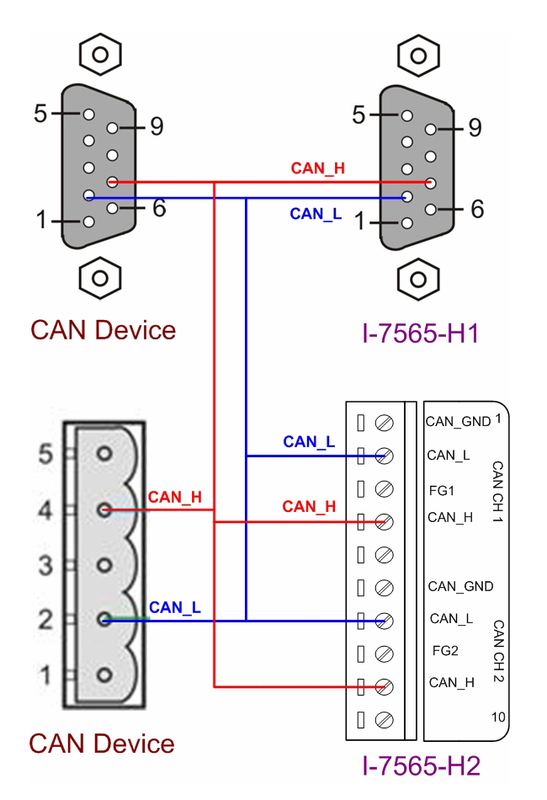 The CAN buffer is 256 data frames for I-7565-H1 and 128 data frames in each CAN port for I-7565-H2. Easily transmit/receive CAN messages for testing and display the time-stamp of each received CAN message. Provide saving the CAN message as “TXT” file for data log. Provide sending CAN message by using the internal timer of module for high precision transmission. Check / Reset module status remotely and get current CAN bus message flow. Users can develop own program by API library quickly and easily.